Bandera is a rustic small town in the Hill Country of Texas that is proud to call itself the "Cowboy Capital of the World." Nestled in central Texas, this little town (pop. 900 or so) holds a "really big place in the hearts of Texans," and is a regular destination for weekend motorcyclists from the big cities of Austin and San Antonio. Also attracted to this crossroads of State Highways 16 and 173 are "Winter Texans" -- those snowbirding RVers from "Up North" who still remember John Wayne and watch reruns of Gunsmoke in black-and-white. 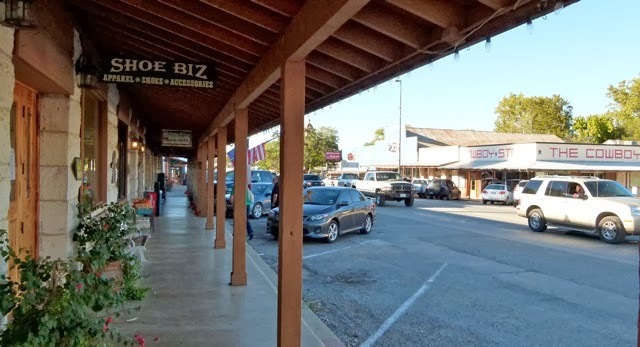 The Bandera Chamber of Commerce wants visitors to be reminded of "a different, more authentic, era, when a handshake was all the contract you needed, self-reliance was the norm, and chivalry was a given. There is a spirit of independence and individualism here that speaks of the cowboy tradition of hard work and hard play." 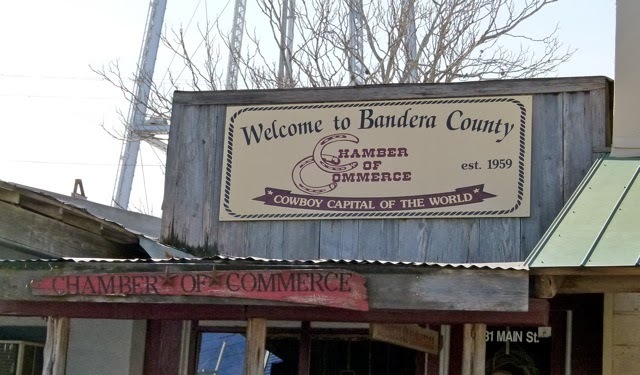 Rich in early western history, "after the Civil War, Bandera was used as a staging area for cattle drives to Dodge City and beyond. Each year during Labor Day weekend, Bandera holds a longhorn cattle drive through the streets of Bandera." Bandera strives to embody its strong rodeo tradition. Today there are often horses tied to downtown hitching posts, along with Harley Davidsons and Gold Wings. According to HillCountryCruising.com: "The ride to Bandera is a very scenic one no matter which route you take." Oh my goodness, you barely touched on Bandera. Too bad you didn't get to spend at least a weekend there to experience some of the charm first hand. Bandera is a fun place to visit. One year we were heading from the East toward the Southwestern Deserts and we stopped in Bandera for the night. We decided to explore a little so decided to stay an extra day. We ended up staying for two months in a lovely campsite along the grassy banks of the river with full hookups and easy walking distance to town. The town, the shops, the events, and the people were all real "cowboy" fun. The locals were friendly and we had a great time. Bandera is one of those places that once you've found it, you keep going back again and again. It just feels right. We stopped for a two night stay three years ago, and had to force ourselves to leave after six nights due to a prior commitment! Wednesday night steak BBQ at the 11th Street Bar was not to be missed, as well as a visit with Hoot Gibson, hearing about his travels via horseback to the Calgary Stampede, and meeting many of the other friendly, wonderful residents of Bandera! We could have stayed much longer and vowed to return someday! What rv parks did people stay at when you stayed there? All information on this website is copyrighted by RVtravel.com, 9792 Edmonds Way #265, Edmonds, WA 98020. Write editor Chuck Woodbury at Chuck(at)RVtravel.com. Any information gathered by visiting this website is kept private and never sold or shared with outsiders.